Order your copy of PTDI's new primer for the ELDT. Complete the form below to order your PRINTED copy. Discount available to schools with PTDI certified courses. How to pay: Online orders can be made with a credit card. If you wish to pay by check, print the completed order form and mail with your check payment to PTDI. Order a digital edition of the guidebook from the following locations. For support contact the digital provider. The ELDT applies to driver trainees applying for their commercial driver’s license (CDL) for the first time; an upgrade of their CDL (e.g., a Class B CDL holder seeking a Class A CDL); or a hazardous materials (H), passenger (P), or school bus (S) endorsement for the first time. Driver Trainees must complete a prescribed program of instruction provided by an entity that is listed on FMCSA’s Training Provider Registry (TPR). 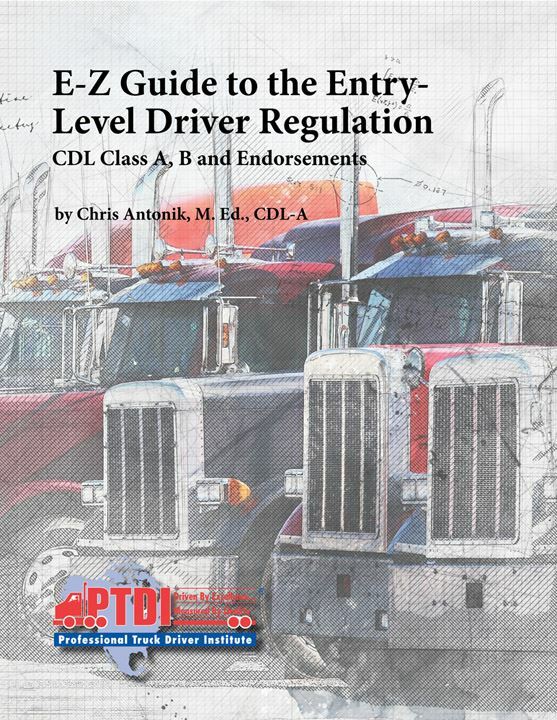 PTDI's E-Z Guide to the Entry-Level Driver Regulation outlines the new minimum requirements for driver trainees and entities that train entry-level drivers. This 50 page guide helps you focus your compliance efforts! For those assessing where to start with the new ELDT regulation, this publication is a comprehensive primer that guides your focus. The Guide is a must for trainers, safety directors, administration and instructors. No, I am not currently affiliated with PTDI. Your book will now be shipped to the following address you enter and NOT your billing address.